The Crescent and the Ring: Moon Meets Saturn Tonight! Look to the skies this week to see a crescent moon and Saturn pair off. John Nelson took this image of the moon on May 31, 2014. If the weather is clear in your area this evening, you'll have an opportunity to see two of the most popular objects to view through a telescope: the moon and Saturn. 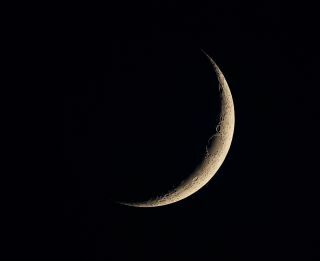 About an hour after sunset, roughly one-quarter of the way up in the southwest sky will be a crescent moon, just over one-quarter (27 percent) illuminated by the sun. Of course, the moon is nowhere near Saturn in terms of actual miles. The moon is 246,300 miles (396,200 kilometers) from Earth, but Saturn is 965.8 million miles (1.55 billion km) away from this planet. Or, put another way, Saturn is more than 3,900 times farther out in space than the moon. And yet, tonight, the two objects will be conveniently placed near to one another in the mid-September evening sky. The moon's placement in the sky relative to Saturn makes it quite easy for neophytes to identify the wondrous ringed planet. Both the moon and Saturn will be available for viewing until they set at around 10 p.m. local daylight time. Without question, Saturn is the showpiece of the night sky. The famous rings can be glimpsed with a telescope with magnification of 30-power or higher, and currently these rings are tilted 24.5 degrees to Earth-based skywatchers' line of sight. The rings consist of billions of particles, ranging in size from pieces of dust to chunks measuring perhaps 30 feet (about 9 meters) across. The particles are composed largely of water-ice and some rocky meteoroids. The ancients regarded Saturn as the "highest" planet, occupying the outermost or highest sphere before that of the fixed stars. Galileo, using his crude, imperfect "optick tube," found that Saturn has an odd pair of appendages or companion bodies on either side. He announced this discovery in 1610 with an anagram written in Latin; the jumbled letters could be transposed to read: "Altissimum planetam tergeminum observavi" ("I have observed the highest planet to be triple"). Not until a half-century later did telescope lenses improve enough to reveal the ringlike nature of these "appendages." Currently, Saturn is in the constellation of Libra, the Scales. Since Saturn requires 29.5 years to orbit the Sun, the planet's progress through the 12 zodiacal constellations is quite slow, averaging roughly 2.5 years per constellation. This planet was last located in Libra in 1983.